On Friday the 2nd of September, at the Auditori Teulada Moraira auditorium, the 6th DOLIA Enotourism and Gastronomy Exhibition was held, an event which promotes the preservation of the countryside and landscape under the umbrella of the Muscat of Alexandria grape. Within DOLIA, we viewed the first part of TRILOGIA3ARTS,an original project from Auditori Teulada Moraira combining different disciplines, whose common factor is the work of Alicante sculptor Quico Torre, created with the solid surface from PORCELANOSA Group, KRION®. Specifically, the project combines three major arts: gastronomy, photography (with the participation of photographer Ouka Leele, 2005 National Photography Award winner) and dance, with renowned dancer and choreographer Igor Yebra. 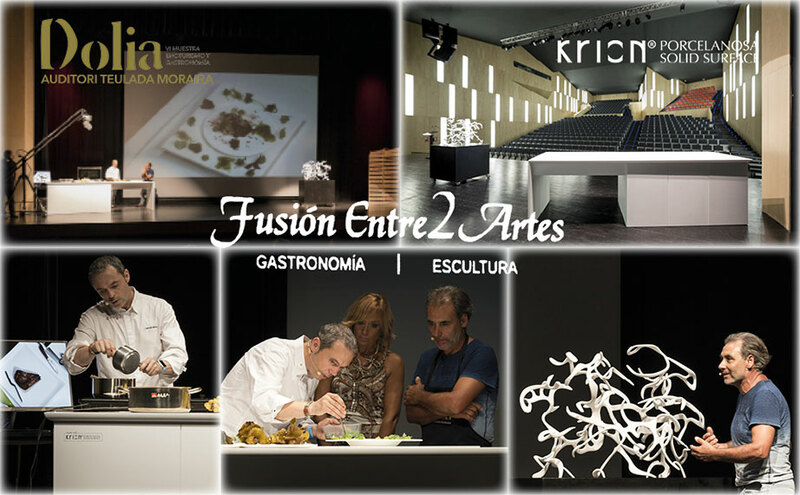 In a spectacular start to the trilogy, we enjoyed the “COMBINAITON OF TWO ARTS”, with the gastronomy of Manuel Alonso (Restaurante Casa Manolo - Daimús, 1 Michelin Star and 1 Repsol Sun) and sculpture by Quico Torres (who has worked artfully with our material KRION® in cities such as New York, Paris, London and Milan), with the sea as a starting point for the work between the two artists. This led to a KRION® sculpture on stage and a countertop also made from our solid surface, demonstrating the teamwork of these two artists. We would like to thank bothManuel Alonso and Quico Torres for their commitment and loyalty to our material, and Maite Serrat, Director of Auditori Teulada Moraira, for allowing us to form part of this unforgettable evening.